OverviewThere is one force in the universe that keeps good and evil in perfect balance. It is called the Tree of Mana. But a magic sword has tricked a young warrior into upsetting this balance, spreading evil through the land. There was a time when SquareSoft could do no wrong, especially when it came to RFGs… the most obvious example being the Final Fantasy franchise. By 1994, Square had become the undisputed dominant force of the genre along with Enix in a close second…a company with whom Square would merge in 2003 to form Square Enix. Square had a proven history of producing high-quality titles which tapped into the full potential of the technology available at the time no matter the console. 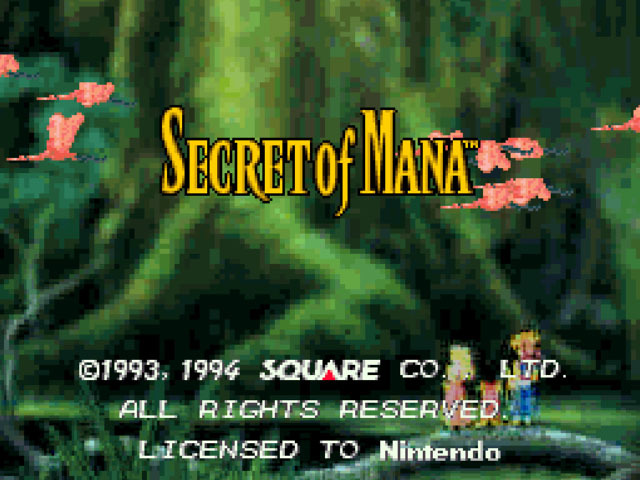 While Chrono Trigger and Final Fantasy VI are predominantly considered to the two best Square titles for the SNES, my personal favorite has always been Secret of Mana. I received SoM for Christmas in 1993 and it blew me away from moment one. I’m a lifetime RPG fan, but SoM is special in a lot of ways. Visually, it takes cues from The Legend of Zelda: A Link to the Past as it’s presented in 3/4 perspective. Instead of cutting away to randomized turn-based battle sequences like Final Fantasy, SoM uses real-time battles whereby you can see advancing enemies and choose how to engage or flee. Another fantastic element is the menu system which utilizes scrolling wheels and sub-menus for quick and intuitive selections. But, perhaps what makes SoM most unique is that it’s actually a multi-player co-op game. As discoverable allies join your party, a buddy can actually take control of the other two additional characters! Otherwise, a single player could adapt the other characters’ logic so that they could act independently and would react accordingly in various situations. It was always more fun to have a friend or two jump in and help, but it certainly didn’t detract from the overall experience when going it alone. By now, everyone probably knows the Nintendo/Sony story about how their proposed partnership would have spawned the SNES-CD, but instead eventually led to Sony breaking off and creating the first PlayStation console. 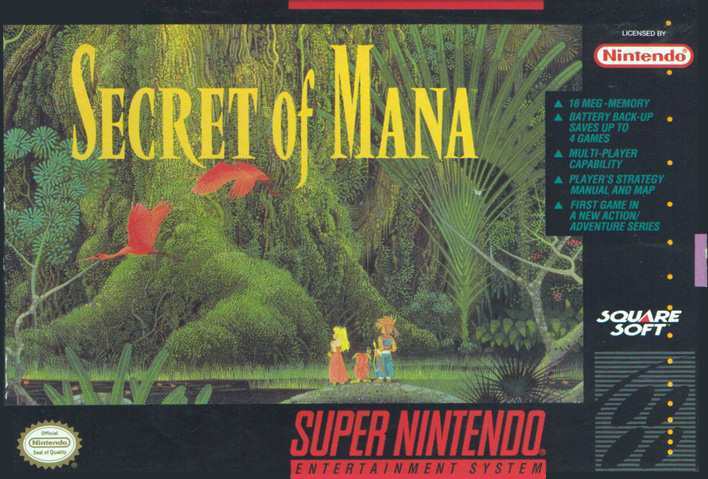 The lesser-known story, however, is that Secret of Mana was originally intended to be a launch title for the SNES-CD…perhaps even the pack-in game. Before the dissolving of the Nintendo/Sony relationship, Square was programming SoM with the intention of it being a massive release on the CD format. Midway through production, Sony and Nintendo went their separate ways and the SoM project was nearly scrapped. Initially believing there was no way they could adapt the game to fit on an SNES cartridge, the game’s programmers were eventually overruled by Square corporate and the project was forced to move forward. This contentious episode is what is believed to have precipitated Square’s eventual move away from Nintendo and toward Sony in the late 90’s. SoM was eventually launched as a cartridge game, but there was certainly no perceivable loss of quality or scope in the final product. Graphically, SoM is one of the most beautiful, vibrant, and artistically realized games ever available for the SNES. The character designs and animations are fluid and precise. SoM also showcases some of the best use of the SNES’s Mode 7 graphical scaling capabilities (the flying dragon sequences are breathtaking). The sound pallet gushes with flavor. And the music…ah, the music! Composer Hiroki Kikuta mixes one of the finest 16-bit soundtracks of all-time in SoM with quirky, upbeat tunes, low-tone serious melodies, and fully-orchestrated anthems. It’s all over the place and it’s wonderful. As with nearly every Square title, compelling storytelling and full-fledged characters are present and in force. One can only ask “what if” when thinking back to the Nintendo/Sony saga and how it would have affected the future of the industry…which I feel we benefitted from in the long-run overall. Same can be said of the Square/Enix merger…which I feel generally hurt things in the long-run. Overall, a lot of battle lines were drawn in the gaming industry during the last decade prior to the turn of the millennium. Some would claim that those battle lines served to create some of the greatest entries in the history of video gaming. When reflecting on Secret of Mana, it’s hard to argue. Now you can add videos, screenshots, or other images (cover scans, disc scans, etc.) for Secret of Mana (Europe) to Emuparadise. Do it now!